Over the past decade, portable hard drive capacities have gotten larger and larger prompting us to store more of our important data onto these large backup drives yet hard drive durability has remained pretty much unchanged. Many times a single accidental drop can cause complete data loss, which is a big issue especially for those of us who tend to throw around these portable hard drives and use them in situations where drops may occur. This is why today we’ll be reviewing the Transcend StoreJet 25m3 1TB USB 3.0 portable hard drive. 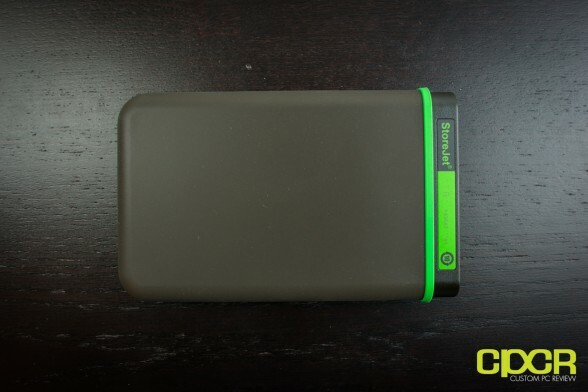 The StoreJet 25M3 is a portable hard drive from Transcend’s ruggedized line of portable hard drives and its claim to fame of course is that it is shock resistant and drop tested to comply with MIL-STD 810F standards. In addition to its rugged design, the StoreJet 25M3 is also a performer as it includes USB 3.0 support,so you’ll be able to take advantage of the full performance of the included hard drive as well. Wanna know how the StoreJet 25M3 fared? Flip the page to find out! 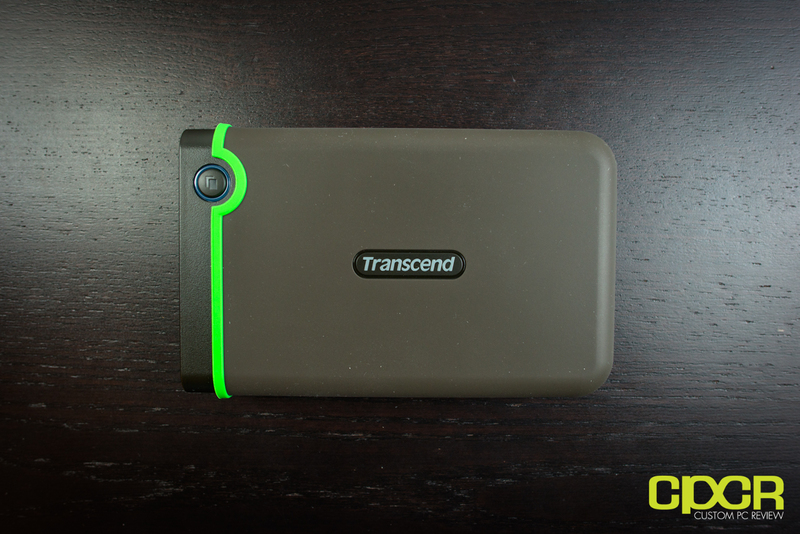 Here’s a look at the packaging for the Transcend StoreJet 25M3. 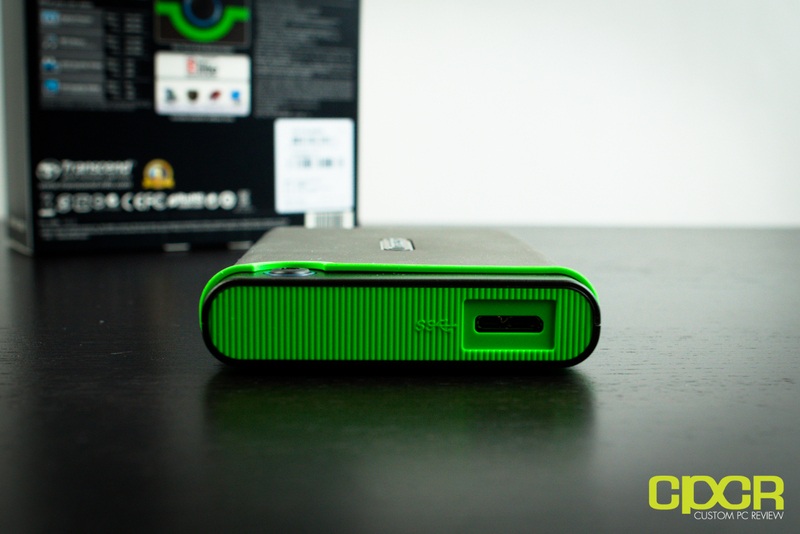 For our review today, we have the 1TB edition of the drive, but it’s also available in 500GB and 750GB flavors as well. 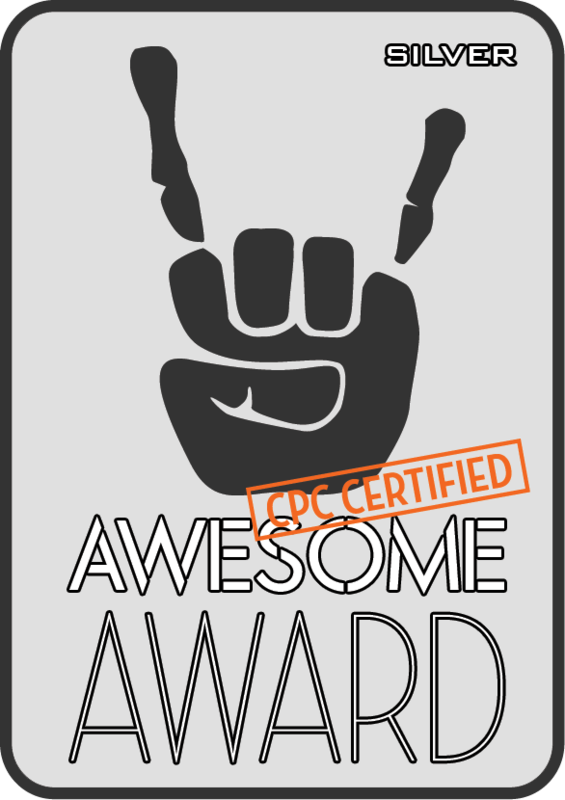 Included in the packaging we get some documentation along with a USB 3.0 cable. The USB 3.0 cable features two connectors at the end for those who don’t have access to higher powered USB ports. That said, any standard USB 3.0 to micro USB 3.0 cable should work. 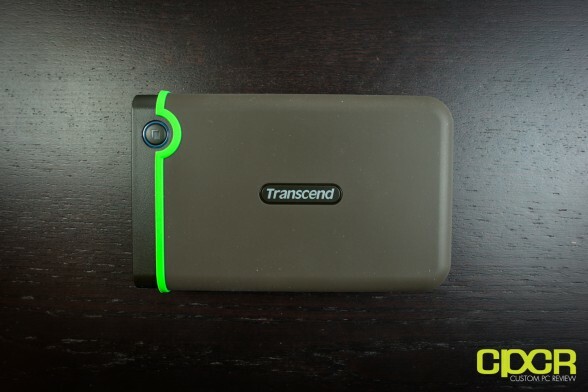 Of course, we also get the Transcend StoreJet 25M3 1TB unit itself. It’s a fairly standard portable hard drive with only a single backup button up front. With the exception of the top, the entire unit is wrapped in a rubber coat. Here’s a look at the back of the unit. There’s not much going on here. The top of the back of the unit has a small amount of information such as the capacity and the serial number. At the top of the StoreJet 25M3 is a single micro USB 3.0 port. This is nice since external power is not necessary for the drive to work. 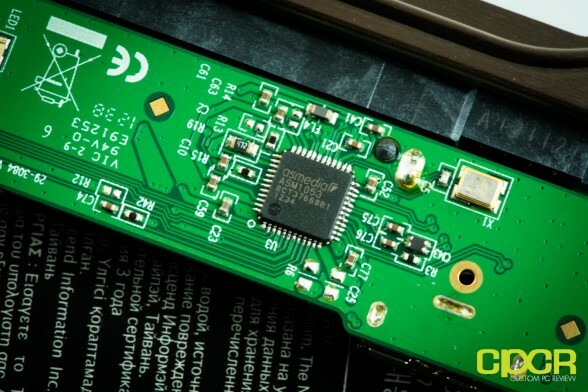 Let’s take a closer look at the internal components on the StoreJet 25M3. The first step is to remove the rubber casing covering the unit itself. This simply slides on and off the unit. 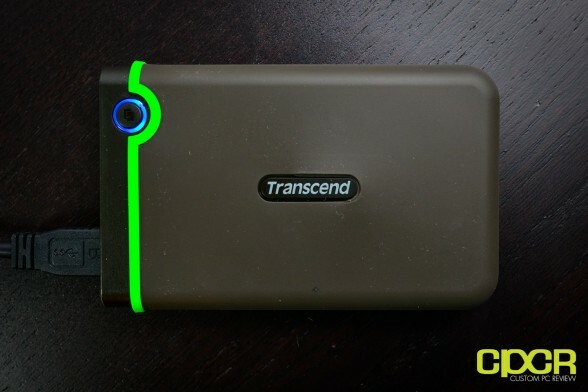 In addition to the rubber housing on the exterior of the unit, Transcend has incorporated an additional rubber shell around the hard drive and internal circuitry for additional protection. This provides the shock protection that allows the unit to be MIL-STD 810F drop certified. 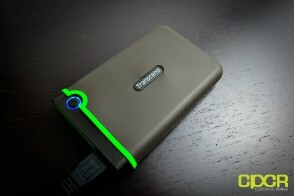 Here’s a look at the rear of the portable hard drive. There’s not much going on here, but we can see that the internal rubber shell covers the back partially as well. This is to allow heat to escape, but you’ll definitely want to keep the entire unit in a cool place as there aren’t any vents or heatsinks for heat from the hard drive itself to escape. For the USB 3.0 interface, Transcend is using the ASmedia ASM1053 bridge. Plugging in the Transcend StoreJet 25M3, we can see that the backup button lights up blue as an activity indicator. Alright, so before we head onto performance testing on the StoreJet 25M3, let’s take a look at some of the software it comes with. The StoreJet 25M3 does not come with any included disks, but the software itself is pre-installed on the drive itself. 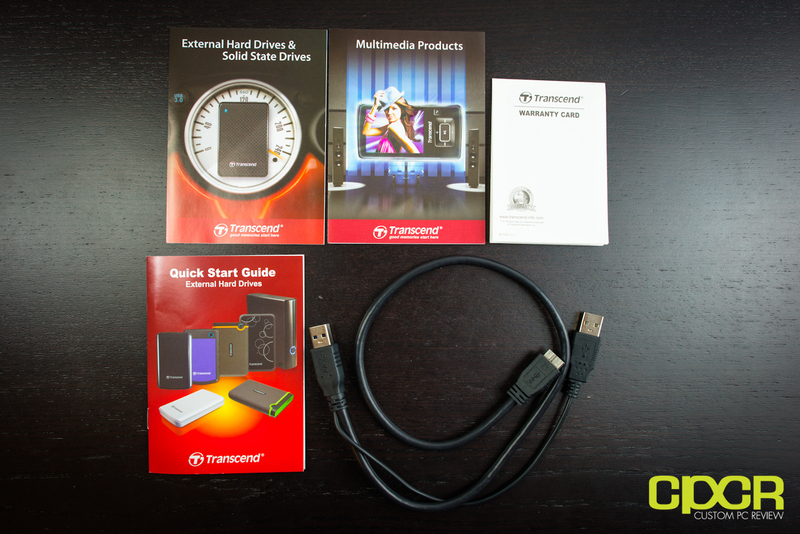 Software and manuals may additionally be downloaded via the Transcend website located here. 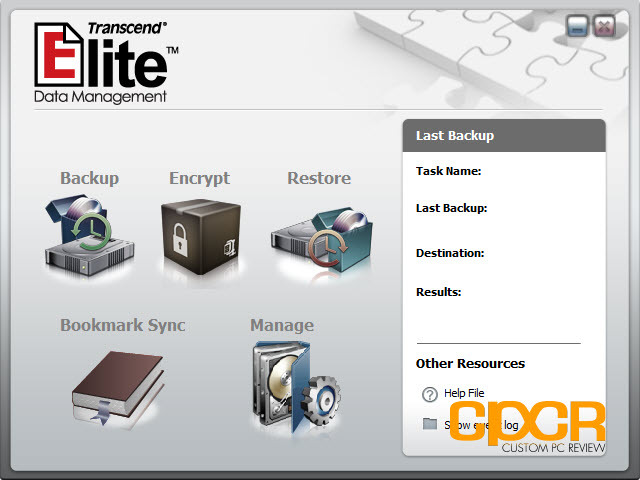 The first piece of software here is the Transcend Elite data management utility. 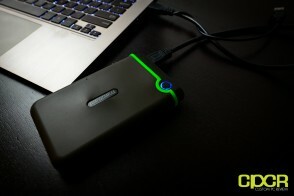 This allows for setting up backups, encrypting of the drive, syncing web browser bookmarks, etc. 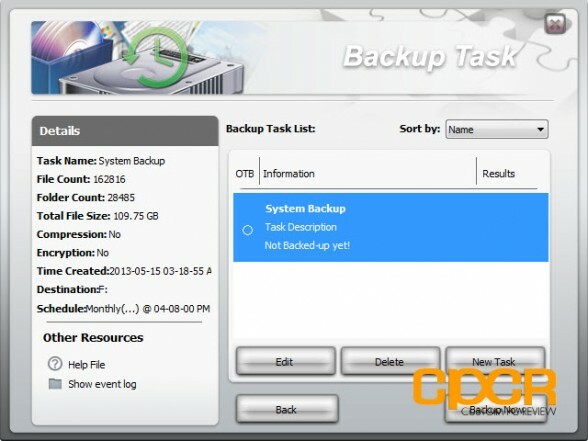 The main feature for the Transcend Elite Data software is of course the backup function and overall it does its job quite nicely. Tasks are created and can be scheduled to run at certain times. That said, the software can use a bit more polish as it does seem a bit rough on the edges with Chinese help files popping up when errors occur. Transcend also offers the RecoveRx software, which is a data recovery utility that’s aimed at Transcend SD and CF cards, but is also compatible with the StoreJet 25M3 as well. It’s fairly simple to use and does a decent job recovering deleted files considering that it’s simply just free, bundled software. 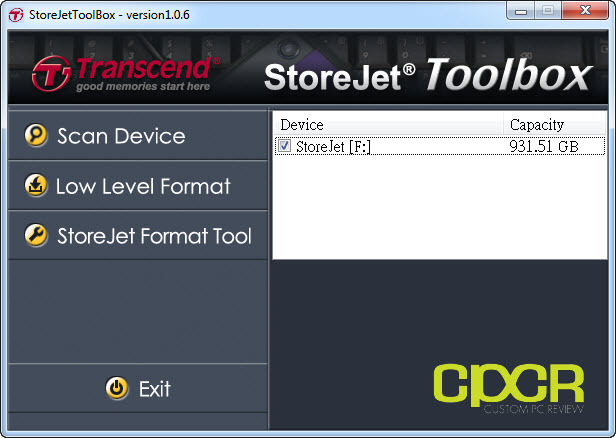 Here’s a look at the StoreJet Toolbox. This application is a simple one as all is does is allow for easy formatting of the drive. Of course, similar functions are available right through both the Windows and Mac OS. 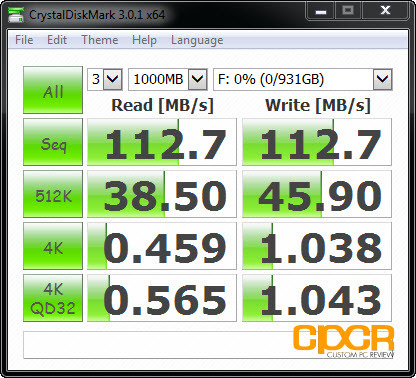 Taking a look at performance here, we can see that performance for the drive tops out at around 114 MB/s sequential writes and 113 MB/s sequential reads, which is generally about the top performance found on a 5400RPM notebook hard drive. USB 3.0 is rated at up to 5Gbps, which is roughly around 400 MB/s after accounting for some encoding overhead, so it’s more than capable of handing the maximum performance of the hard drive. According to Transcend, the StoreJet 25M3 is MIL-STD-810F Method 516.5 Procedure IV drop tested. According to page 349 of the MIL-STD-810F spec, which refers to Method 516.5 Procedure IV, a package with a gross weight of 0 to 20 lbs should withstand a drop of 30 inches, or 2.5 feet. A PDF version of the MIL-STD-810F spec can be found here. For testing, I dropped the StoreJet 25M3 on concrete a total of 5 times for each of the drop heights listed. The unit was dropped a total of 20 times. The drive was tested every 5 drops at 2.5 feet, 3 feet, 4 feet, and 5 feet. Since a height of 2.5 feet isn’t all that high, I also tested dropping the StoreJet 25M3 at 3 feet, 4 feet, and 5 feet. The drive functioned without issue after the drops. Alright, so with testing out of the way, let’s talk about the StoreJet 25M3. The main draw of the StoreJet 25M3 is that it’s a durable, portable, external hard drive that will offer decent performance, and as far as I can tell, it’s capable of doing everything as advertised. 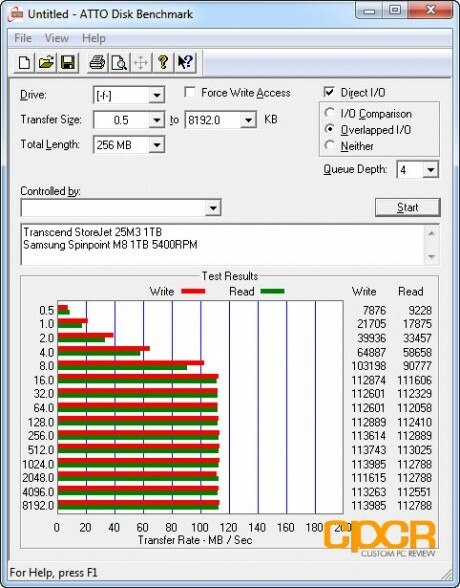 Performance wise, you’re looking at around 113 MB/s sequential reads and writes as long as you’re operating off USB 3.0, which should be plenty of performance for backing up documents, music, vidoes, etc. Those looking for something a bit more high speed and a bit more rugged should definitely take a look at SSDs as they’re able to offer much faster performance and much greater durability albeit at a significantly higher cost. During testing I didn’t have any issues with the Transcend StoreJet 25M3, but I did have one minor concern with the unit – ventilation and cooling. 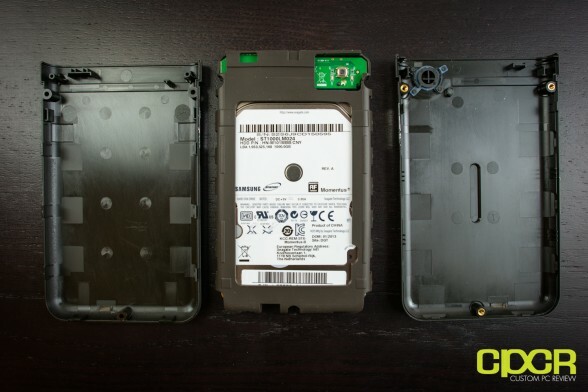 The entire casing doesn’t appear to have any sort of ventilation or heat dissipation, and the drive is wrapped with multiple layers of rubber material, which could potentially cause premature drive failure if the drive is left running for extended periods of time in hot environments. Of course, this is something that would require much longer term testing and once again in my testing, the drive hasn’t had any issues. 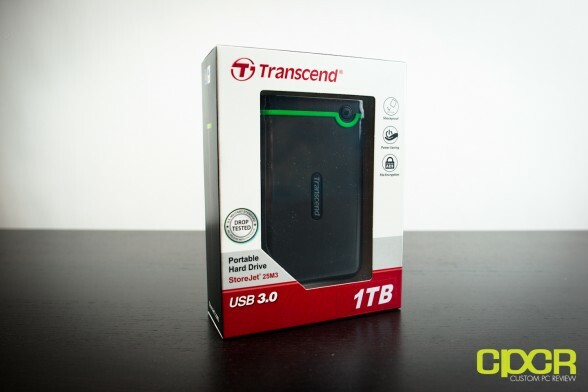 Pricing on the Transcend StoreJet 25M3 1TB as tested today is $92.98, which puts the drive at around $0.09/GB. This isn’t too bad considering this is a ruggedized drive with USB 3.0 support. That said, a quick look on Amazon shows that competitor Silicon Power has a similar drive, the Silicon Power Rugged Armor A15 1TB, which features a similar ruggedized design and supports USB 3.0 as well. It’s currently retailing for about $79.99 ($0.08/GB), which is about $13 cheaper than the StoreJet 25M3. From outer appearance and featureset, it looks like both the StoreJet 25M3 and the Rugged Armor A15 are sourced from the same ODM, so the StoreJet 25M3 1TB could possibly be what is essentially the same product at a higher price. That said, I haven’t had the opportunity to review the Rugged Armor A15 so I can’t say for sure and do keep in mind that pricing is always variable, so I wouldn’t be surprised to see pricing on the StoreJet 25M3 1TB become a bit more competitive down the line. 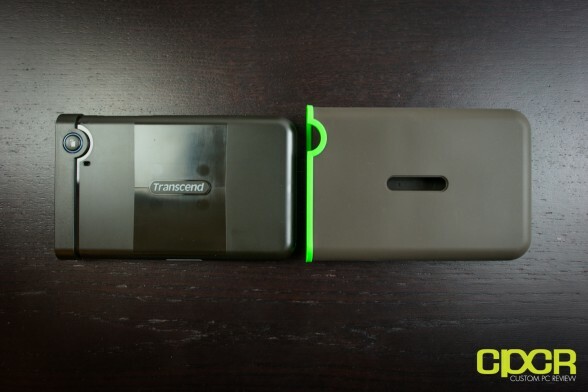 Overall, the Transcend StoreJet 25M3 1TB functions as advertised and for those needing a fast, durable portable hard drive, I reallly don’t see why not.